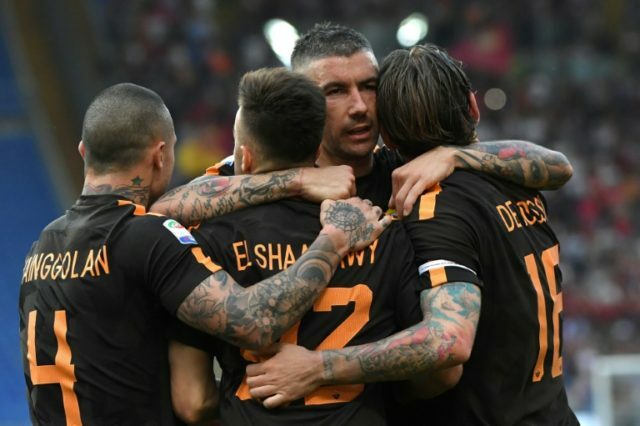 Milan (AFP) – Ten-man AS Roma warmed-up for next week’s must-win Champions League clash with Liverpool by easing to a 4-1 win over struggling Chievo to consolidate third place in Serie A on Saturday. Edin Dzeko scored in either half with Patrik Schick and Stephan El Shaarawy also on target as Roma overran the side from Verona despite being a man down after Juan Jesus saw red ten minutes into the second half. In the battle for Champions League football next season, Eusebio Di Francesco’s side move three points ahead of Lazio, who play Torino on Sunday, with Inter Milan four points behind in fifth before their clash against leaders Juventus in Milan later Saturday. As well as being crucial in the race for Champions League places, the game in the San Siro could be decisive for the title race with Juventus’s lead on second-placed Napoli cut to one point with four games to play. “This game was important for next season and Champions League qualification, so we had to win,” said Dzeko. Roma next face Liverpool in the Stadio Olimpico on Wednesday where they have to overturn a 5-2 first leg deficit to advance to the final. The hosts dominated even after Brazilian defender Juan Jesus was sent off for fouling Inglese and Alisson saved the resulting penalty, with El Shaarawy and Dzeko adding two more within ten minutes. Inglese headed in a consolation goal for Chievo three minutes from the end, but the side from Genoa remain two points above the drop zone.